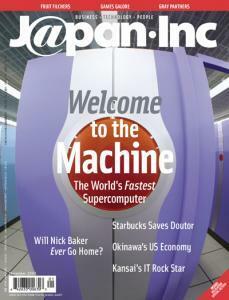 On the cover: Straight into the eyes of the world's fastest supercomputer. Photograph courtesy of the Earth Simulator Center. "The arrival of the Japanese supercomputer evokes the type of alarm raised by the Soviet Union's Sputnik satellite in 1957. In some sense, we have a Computenik on our hands." Read all about ... the new fad. The Word on the Street from the Heart of Tokyo. Oil and a shared history bring Japanese tourists to Russia's Siberian isle. How domestic roaster Doutor basks in Starbucks' success. Japan's "new" seniors drive consumption. Here's how and why. IT + AC/DC = TNT! At home in Hyogo with Japan's hardest rocking IT whiz. Nick Baker sits in a Japanese prison. He was charged with smuggling drugs into the country -- a charge he vehemently denies. Now his mother is speaking out, collecting signatures and trying to raise money. Will Nick ever go home? A visit to the world's No. 1 supercomputer, in Yokohama. The Earth Simulator studies the planet for clues about the ways of weather and the potential for enormous natural disasters. Writer Tim Hornyak shows us how. The Cost of Demilitarizing Okinawa. Military Analyst Michael E. Stanley examines the imminent plausibility and economic consequences of a US troop pullout from Okinawa. The question is not if, writes Stanley, but when. Tokyo dating agency Destina straddles the seas to link up the lonely. Is the volume of foreign customers entering Japan is really starting to recover? Blowfish bemoans beheading as a sign of the times.